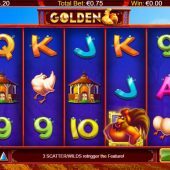 Golden Hen slot is yet another Oriental-themed game this time offering Rooster, eggs and Chinese tokens as the symbols plus variations on the theme. The slot is pretty basic, although we do have 243-ways to win. But it does seem to be a copy of NextGen's Titan Storm slot. 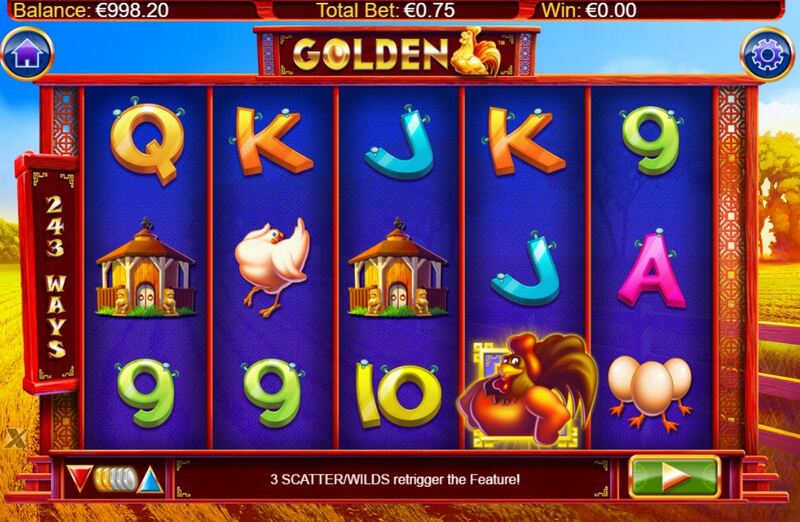 Golden slot is built in html5, making it available across all devices. There are no reel sounds unless Wilds land or wins; instead we are treated to irritating background music that sounds more Country and Western than Oriental - slightly confusing. The 1x Wilds take the form of well fed Gold Hens and only appear on the centre 3 reels but do substitute for the Chinese Token scatters that also only appear on reels 2, 3 and 4 and which trigger the game's bonus. The highest - paying symbol is the Cockerel Weather Vane (at least that's what it looks like!) of which 5-of-a-kind pays a respectable 80x stake, down to the lowest card symbols at 2x stake. Should you land any combination of scatters/Wilds on the middle 3 reels then 10 free spins ensue. They can be retriggered and there are 2 extra benefits during them; Firstly the scatters also become Wilds effectively doubling the amount of Wilds available and secondly any 5-of-a-kind wins attained will be awarded a 5x multiplier. Given the highest symbol pays 80x stake that makes single wins of 400x stake possible! Golden Hen slot is unoriginal, a rehash of Titan Storm as previously said. The background music is dreadful and I had to mute it very quickly. You will never hit huge wins on it as the pay tables have seen to that although the RTP is a very high at 97.22%. You will get a decent session for your stake as the variance is no higher than medium and that may suit many players. It might become one of a number of slots that players weed out their wagering requirement on a bonus, assuming the game is not restricted in the bonus terms.